My 100th post on this blog! Fireworks and huzzahs! Forge (2010), Laurie Halse Anderson, 280 pp. 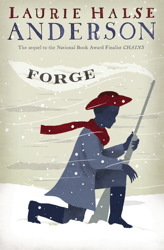 This sequel to Chains delivers on Anderson’s initial promise, providing further exploration of the role of enslaved blacks during the Revolutionary War. This time, Curzon tell the story, as he finds himself separated from Isabel and wintering at Valley Forge with Washington’s troops. We learn that his former owner had promised Curzon his freedom if he agreed to fight for a year. Yet, after 12+ months of danger and deprivation, including time spent as a prisoner of the British, he has no emancipation papers, and he is in constant danger of being dragged back into slavery. Who are his friends? Whom can he trust? Will he find Isabel again? Can he survive that dreadful winter without betraying his principles? The graphic battle scenes show us war at its most terrifying and horrific — Anderson doesn’t hide the gore from her readers. Then she goes on to give us detailed pictures of how the soldiers fared after the battles. Valley Forge is synonymous with frozen feet, but who knew that many of the men didn’t even have trousers or coats that first winter? Anderson describes digging latrine trenches, setting up tents, and building defenses, all in ground frozen hard as rock. Men worked non-stop on minimal rations, and then froze to death as they slept on the bare ground. It’s difficult to read such descriptions now without thinking of men and women fighting in harsh environments like Afghanistan and Iraq, but Forge doesn’t read like an anti-war polemic. The men who survived that winter were much stronger for it, and the army was more cohesive. Washington lost many of his soldiers to desertion, but he could be certain that those who stayed, including Curzon, were his to command. This entry was posted in Historical fiction and tagged Laurie Halse Anderson. Bookmark the permalink.